Will six-member GRCs be a thing of the past? With electoral boundaries being revised ahead of going to the polls, what could some of the changes be? Insight homes in on zones of interest. With Prime Minister Lee Hsien Loong’s directive to consider smaller GRCs, voters will wonder if this is the end of “jumbo” six-member GRCs. Currently, there are two six-member, 11 five-member and two four-member GRCs. This brings the average size of a GRC to five exactly. Before the 2011 elections, the average size of GRCs was 5.4. Six-member GRCs first appeared in 1997, when four were formed. It was to pave the way for the creation of community development councils which would oversee grassroots organisations and help manage public assistance schemes. In the two elections that followed – in 2001 and 2006 – there were five such constituencies. But in the boundary redrawing exercise before the 2011 elections, only two such GRCs – Pasir Ris-Punggol and Ang Mo Kio – were retained. This time, the former may need to have its boundaries redrawn as its voter population-to-MP ratio has almost reached the upper limit set for such constituencies. The ratio is now 34,486 voters per MP. But will Ang Mo Kio GRC, which is helmed by PM Lee, be downsized, to accommodate a maximum of five MPs too? Going by its voter numbers, it does not have to be. The GRC has 181,327 voters as of last count in April. This works out to 30,221 voters for each of the six members, well within the variation limit. Activists say they expect this GRC to stay the same, and have had no notice indicating otherwise. In fact, several four- and five-member GRCs, such as Tanjong Pagar, Moulmein-Kallang and Marine Parade, are expected to be rejigged. 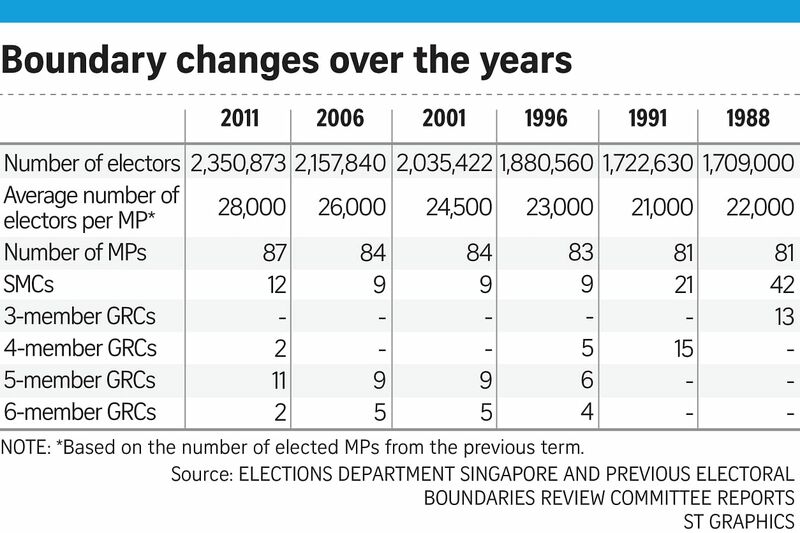 Tanjong Pagar GRC, which will head into the next election without founding prime minister Lee Kuan Yew at the helm following his death in March this year, is likely to see some parts carved out. The word on the ground among activists and others is that Kreta Ayer-Kim Seng will be carved out and combined with parts of Moulmein-Kallang GRC to form a new Kallang GRC. The resulting constituencies from this change are likely to be a mix of four-member GRCs and even some Single-Member Constituencies. Elsewhere, activists at Marine Parade GRC also expect some “tweaking” to the constituency’s boundaries, but not major changes. This could mean that parts of the oddly shaped constituency, that might fit better elsewhere, might be cut. Part of the constituency, for instance, extends all the way to Braddell Heights, 8km inland from the East Coast. It appears more appropriate to make this area part of Potong Pasir or even Aljunied GRC. With smaller GRCs expected, some also wonder if three-member GRCs will make a comeback. These small GRCs were on the electoral map only during the 1988 polls, when GRCs were first introduced. A likely place for them could be in the West – long considered a stronghold of the PAP. Chua Chu Kang GRC has experienced population growth, with 2,500 new BTO units added in its Yew Tee and Keat Hong wards. This has sparked speculation that a new GRC may emerge there, with some parts of Chua Chu Kang GRC joining up with the single-seat constituency of Hong Kah North, now under Senior Minister of State for Health and Manpower Amy Khor. Chua Chu Kang MP Alex Yam says his Yew Tee division, with a population of some 87,000, “has been quite large for many, many elections”. He reckons it is possible that some parts could be carved out, but hopes it will not happen. “My own preference is to keep it as it is... But ultimately, it is a decision for the Electoral Boundaries Review Committee to make, whether they find it still efficient for us to manage such a big population at Yew Tee,” he says. Currently, there are 87 divisions. Political scientist Derek da Cunha reckons it would strike “a fair and equitable balance” if all electoral divisions could be four-member or Single-Member Constituencies, as was the case in 1991. “If the EBRC report carves up the island electorally in a similar fashion now, then I do not think there will be many complaints from aspiring opposition candidates – as there will be ample electoral divisions to go around,” he says.